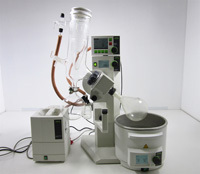 A rotary evaporator (also known as a rotovap) is a device used to turn the liquid form of a chemical into its gaseous form. The liquid is evaporated, or vaporized into a gas that is then condensed back into its pure liquid form to be captured in a container. Marshall Scientific sells all of the necessary components to have a running and fully functional rotary evaporator system. We specialize in Buchi Rotary Vapor Systems and have all of the necessary parts from the Buchi vacuum certified glassware and Buchi V-500 vacuum pumps to the Buchi V-800 vacuum controllers and the Buchi B-490 heating baths. Please take a look at some of our rotary evaporator components we currently have in stock and feel free to give us a call or send us an email if you have any questions.